One of the difficulties when I first started going with a plant based diet was finding dishes that provided a "satisfying" meal. I could eat a pile of rice, veggies and beans and still feel completely dis-satisfied with what I ate. On the other hand it's easy to fool yourself into thinking being "plant based" means you're free to eat all the oreo cookies you desire without consequence. I found the keys for me were texture and dietary fat. I saw this recipe in the forks over knives cookbook and it sounded pretty delicious. 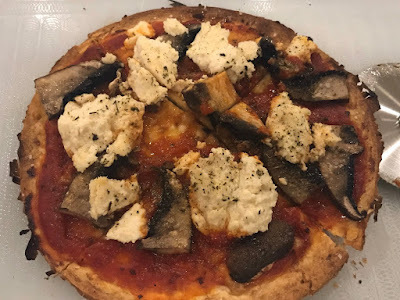 The dried porcinis had a "beefy" smell and mushrooms tend to have a good mouth chewy texture (I used abalone mushrooms to great textural effect) and the use of a tofu "sour cream" gave the dish a good richness. So it checked all the boxes for good potential. Then you dump in the porcini with the soaking liquid and after bit the white wine and let it cook down. (I used a cheap sauvignon blanc) it will thicken up a bit. Give it a taste and adjust with salt and pepper. Finally off heat stir in the tofu sour cream. I found the sour cream at Natural Grocers but it's at Whole foods (and their 365 markets). Place shallots in large skillet and turn heat up to medium heat. Cook until soft, constantly stirring and adding a couple of tablespoons of water to keep the shallots from burning. 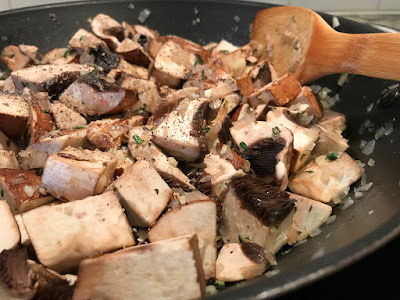 Add garlic and thyme to the skillet and cook for an additional minute. 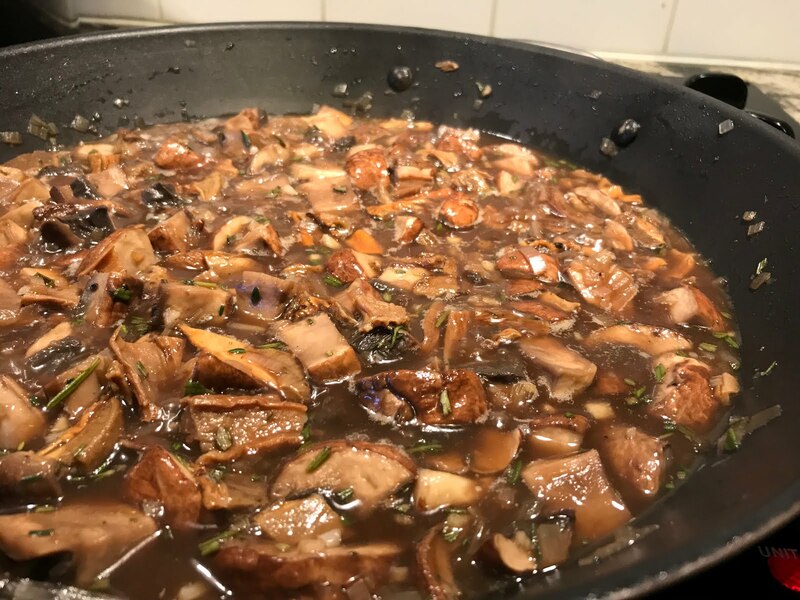 Stir in Mushroom and rosemary and cook until the mushroom pieces are soft about 8-10 mins. 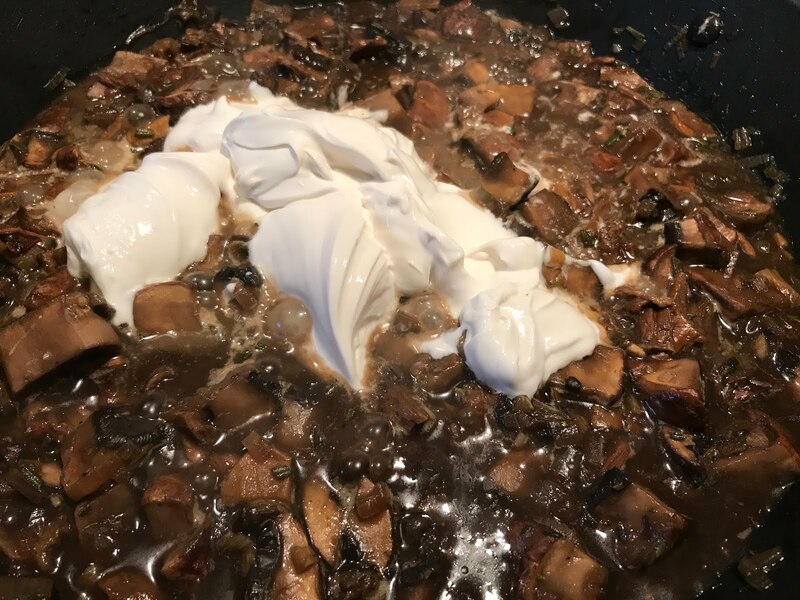 Turn off heat and add in Tofu sour cream and mix thoroughly, letting the residual heat warm up the sour cream. I've always been fascinated by fermentation, the idea of little critters that toil away and magically transform food from one form to something else is somehow magical to me. How did ancient man decide curdled milk could be made into cheese and then later yet the moldy blue cheese is edible and delicous? Or that bubbly fruit juice that sat in a jug a bit too long was worth drinking even if it made you feel a bit dizzy and good? I know a lot of it was a preservation technique but if you were the first to opened up a jar of kimchi or sauerkraut would you think to take a big bite of it? I've dabbled in various experiment, some successful, some less successful. But I happened to have a whole head of napa cabbage in my fridge and was pondering what to do with it. 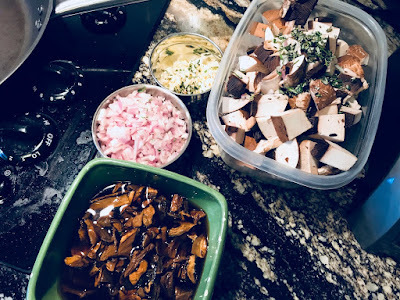 I floated the idea of turning it into kimchi with my wife and she was quite eager for me to give it a try. 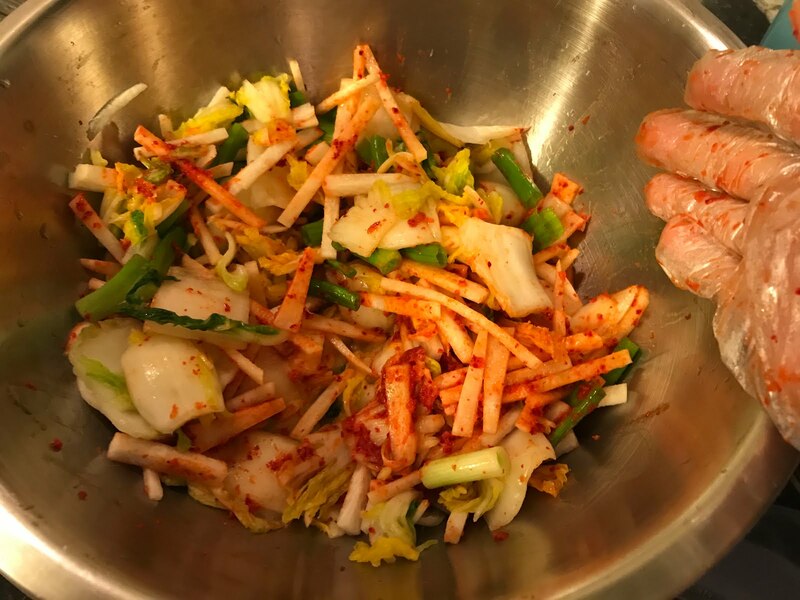 Now if you don't know what kimchi is (I'm not sure what rock you've been hiding under) it's a Korean dish typically served as a side dish (banchan) with your meal or cooked into a stew. If you've had Korean food or even a trendy taco these days, you've seen it, or at the very least you've "smelled it", it's quite unmistakeable. 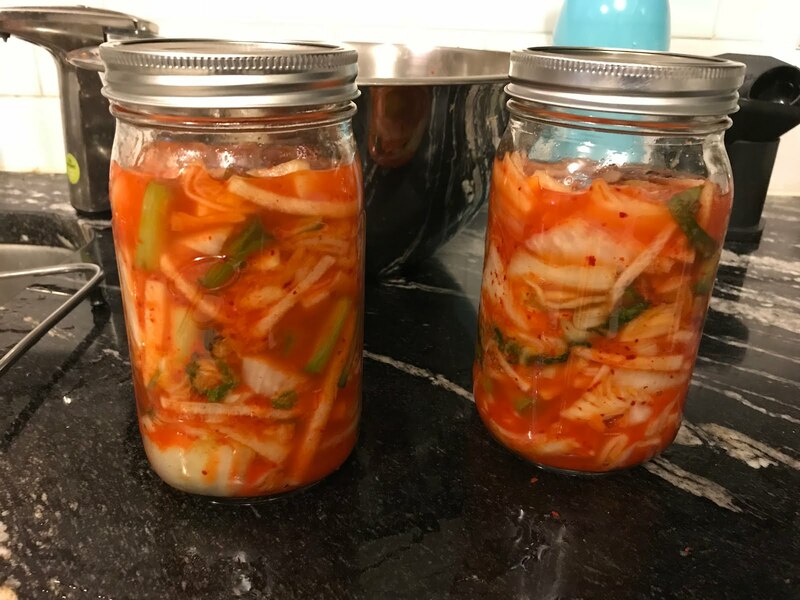 Kimchi is basically a category of fermented vegetables, what most people think of when you say kimchi is a mix of napa cabbage, radish and green onion with a lot of chili pepper, but you can have kimchi made of cucumber, radish, lotus root, carrot basically any vegetable you can cram into a jar and safely let ferment. As with most fermented foods this was a way to extend the life of vegetables when we didn't have refrigeration and vegetables available all year round. Kimchi hasn't always been the kimchi we commonly see today (at least in the west). 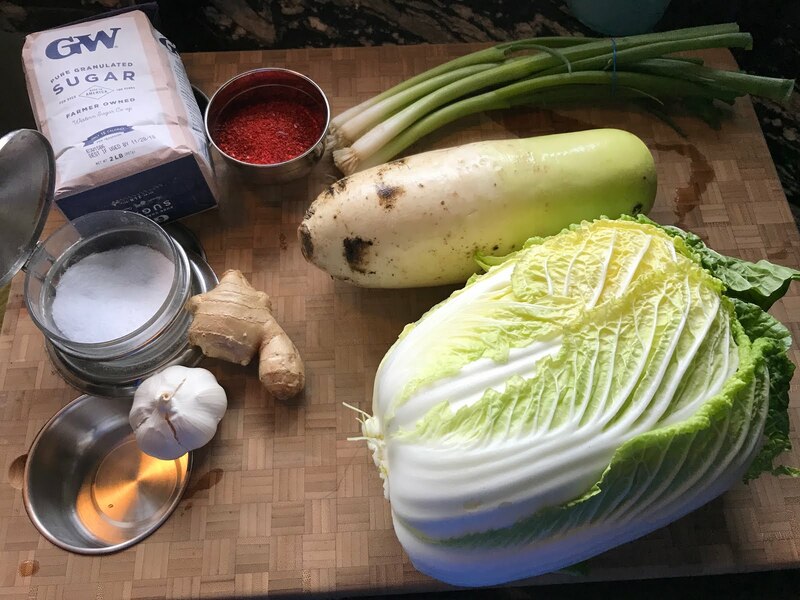 Since the chili pepper was a "new world" ingredient that didn't happen until the after the 17th century, and to my surprise napa cabbage wasn't introduced into kimchi until the 19th century. It's aroma is quite indescribable, sour and "rotten" are some of the words I would use but that's not quite right since "rotten" has often a really negative connotation. 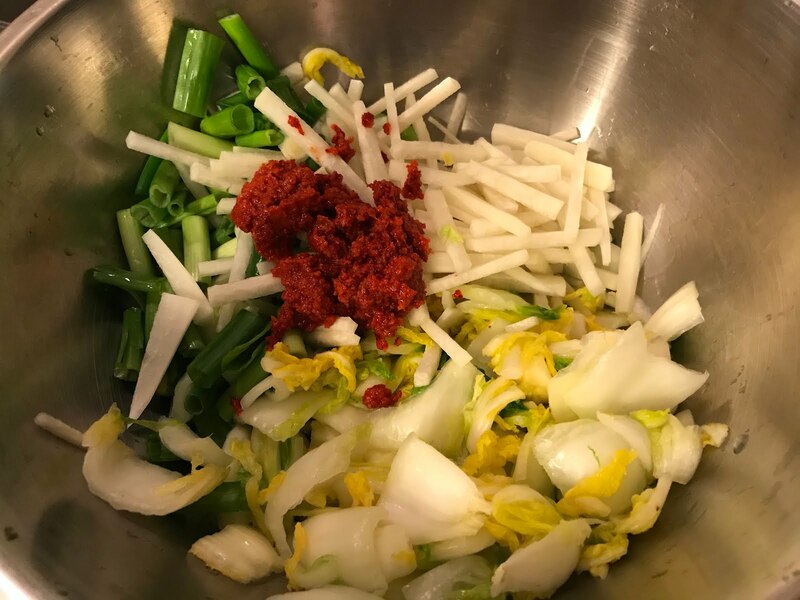 Some people like their kimchi very sour, some not, some like a lot of chili and some prefer seafood as part of the fermentation, basically this is all to say that kimchi comes in a variety of forms and flavors. Ok onto the kimchi making. 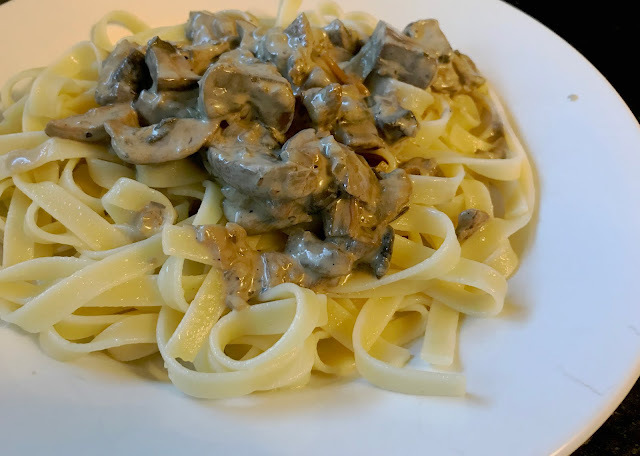 Since I've been following a vegan diet I did opt for a seafood-less version and I didn't replace it with any seaweed (kombu), I'm sure it would have added some extra umami flavor but I wanted to keep things simple. And this recipe is indeed simple, I cobbled together a few sources since everyone seemed to have their way of making kimchi and some instructions were not as clear as others on various steps. 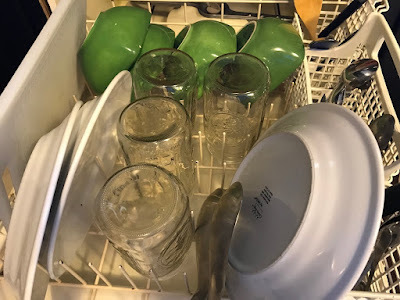 As with anything that you depend on micro-organism to do your work for you, you need to clean your containers well. 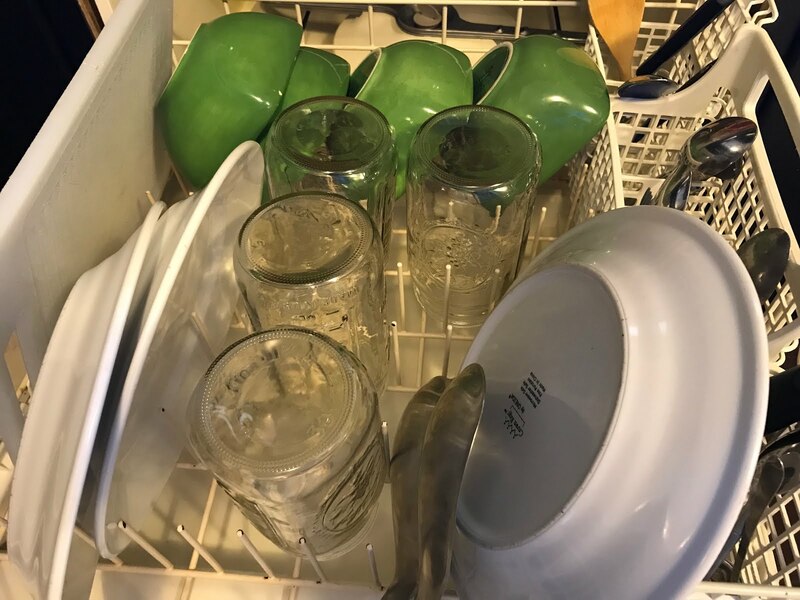 I put my mason jars (and lids) thorough the dishwasher, you don't need to be quite as meticulous as you were brewing beer or wine and use a sterilizing wash. From the ingredients above in the title picture, I fully expected six jars but it turn out that I only needed two. First things first, there's some prep to be done. First cut up the cabbage and give them a good rinse. I cut the whole head in half lengthwise and three lengthwise cuts *almost* to the root of the cabbage (so it would all stay together). And then cut two inch wide segments. Wash well to remove any dirt. Use 1/4 cup of kosher salt (really any salt is fine, just not iodized salt since that can interfere with the microbes). I first salted the cabbage and gave them a really good toss in the bowl and let them sit for about 30 mins. 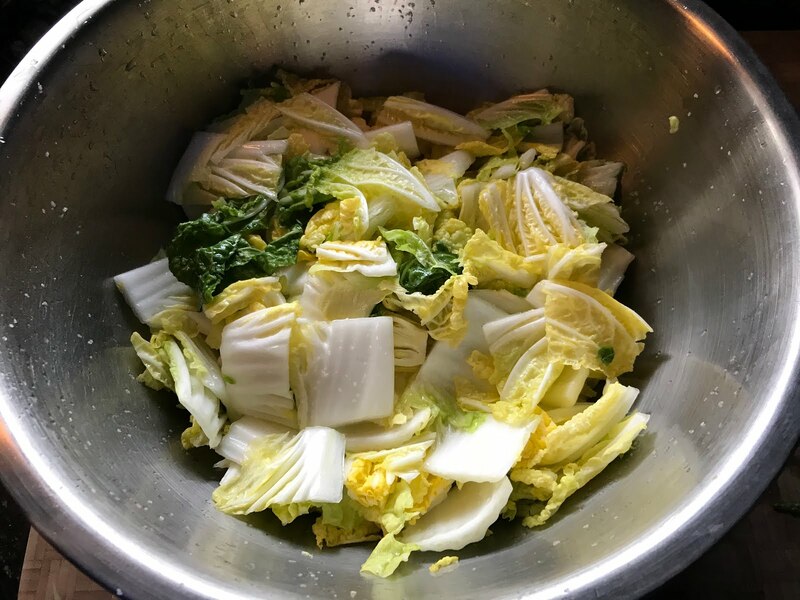 After 30 mins the cabbage wilted a good bit and I filled the bowl with enough water to cover and let it sit weighed down with a plate and a heavy mortar (or any weight). I let this sit a good four hours (three seemed to be the minimum from what I saw). The point is to get a lot of water out of the cabbage. While that was happening I chopped the green onion (white and green parts) and half of the pictured Korean radish (or you can use daikon if that's what you have available). The various sources I used, specified matchstick size or larger, I think matchstick might be a bit small, I went with 1/4 inch by 2 inch sticks. (they'll shrink a bit while they are in the jar fermenting). 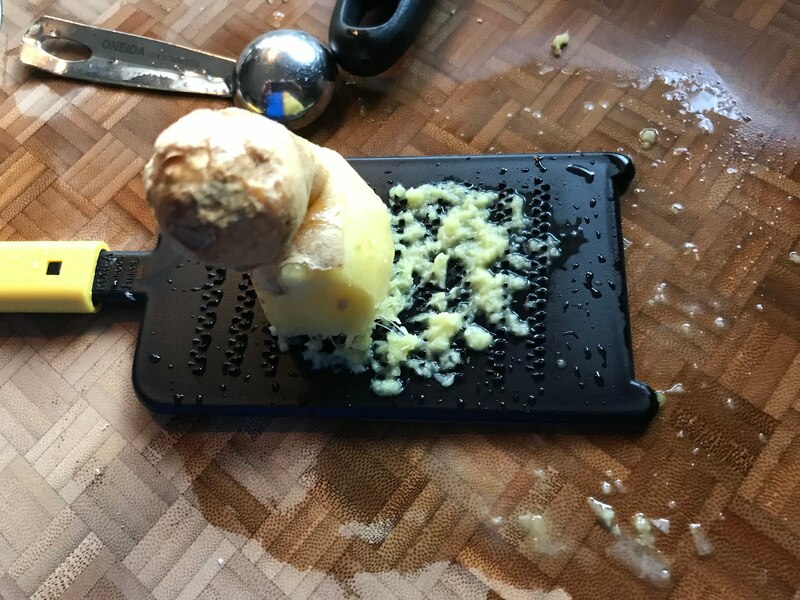 I used a japanese style grater for the ginger and the garlic. I felt like raised ridges pulverized the ginger and garlic to release the juices which I was careful to preserve and use in the jars. I think a microplane or grater would have just shaved small bits. 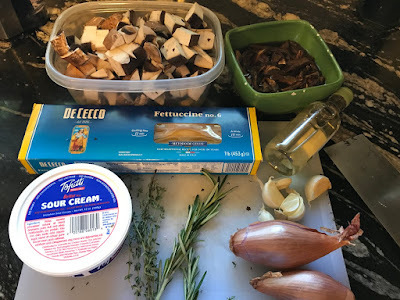 I *HIGHLY* recommend using gloves for the garlic part or you'll reek of garlic for days. 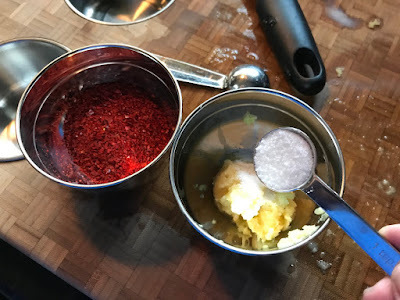 Take the ginger, garlic, sugar and Korean red pepper flakes and mix them together. I ended up using one and half tablespoons of the pepper flake. The sugar's going to give your microbes something to start on. Don't worry you're kimchi will not come out sweet. This produces a mild kimchi, if you want more heat just add more pepper flake. Here's a picture of the final paste when it's all incorporated. Again, using the raised ridged grater on the ginger and the garlic gave me the liquid-y texture for the paste. By now it's dark out so I've lost all the nice natural light for the rest of my photos. Anyhow. Drain the cabbage and make sure to reserve the liquid. If you forget that's ok. Mix two cups of water and 1 tablespoon of salt for a reserve brine. 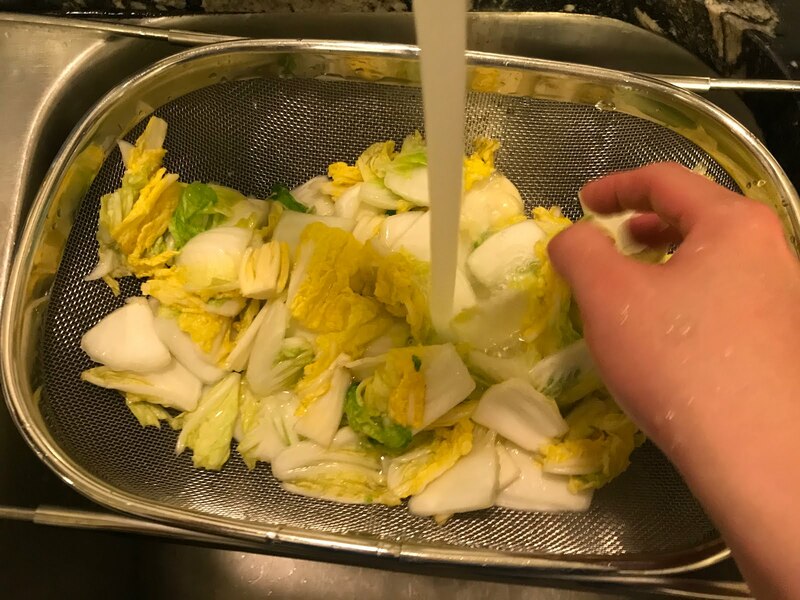 Quickly rinse the cabbage (you don't have to go crazy) and give the cabbage a good squeeze to get the excess moisture out. 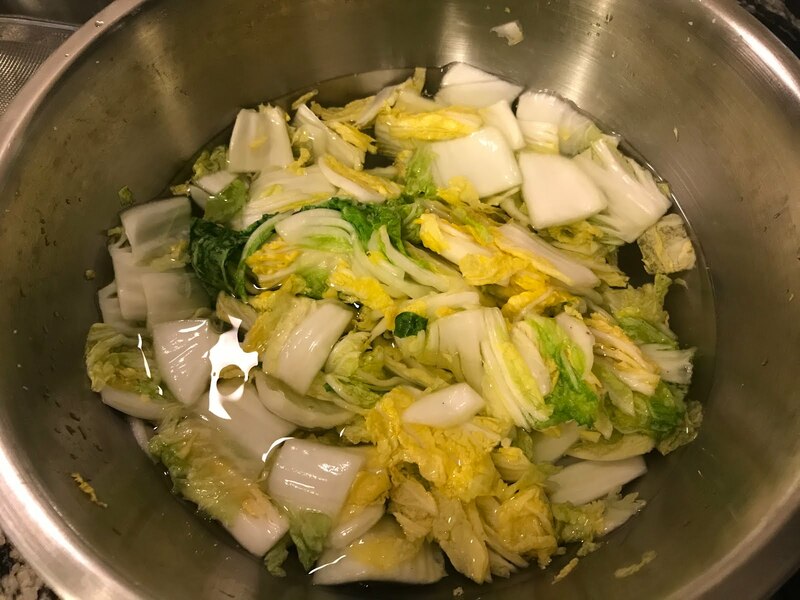 If you don't rinse your cabbage you're going to get really really salty kimchi (some people like that). Again, I *HIGHLY* recommend gloves for the next part. Give everything a very thorough mix and make sure all the vegetables get a coated. 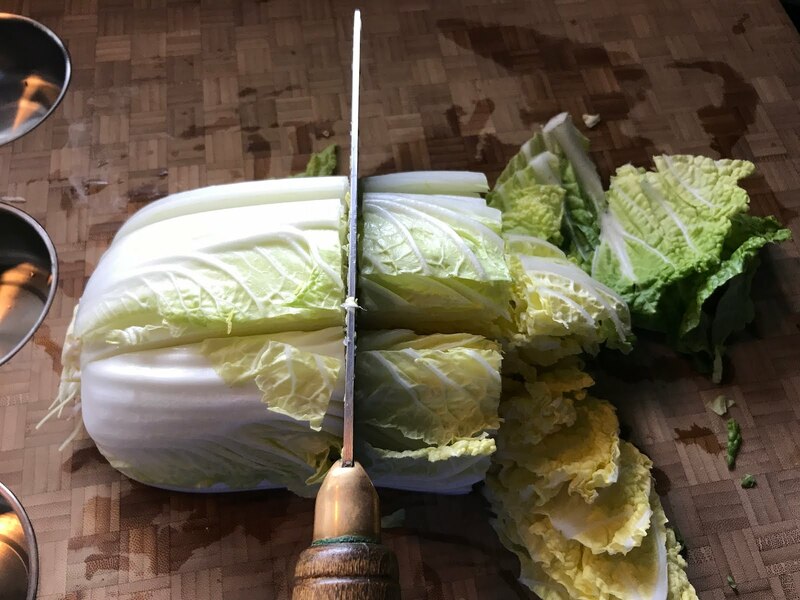 You might find some of your cabbage leaves somewhat stuck together from your squeezing them, this is the time to loosen them up. It's starting look and somewhat smell like kimchi. Time to pack them in the jar. When I say pack them in the jar I mean really jam them in there. Take handfuls of the vegetables and use a fist to push them down hard into the mason jar. We're going for compact tightness. As you push you'll notice liquid rising to the top. (that's a good thing). I left about 2 inches of headspace in the mason jars. And then take the reserve brine and cover the vegetables (if you don't already have liquid covering). You may find you have some floaters, I took some snack sized ziplock bags and filled them 1/3 way with brine, zipped them up and put it on top to make sure you don't have any vegetables floating. You want everything below the brine to prevent mold from forming on the vegetables, mold doesn't like salty water. It should look something like this (I put the brine bags in after this photo). I would put this somewhere cool/room temperature. With some sort of baking dish or pan underneath. Do *NOT* tighten the mason jar lids all the way, just give them a lose turn so the lid stays on. Be prepared, whatever space you put these jars in will smell like kimchi. You will find that some of the liquid spills out over the next few days. The reason is that there's going to be a bunch of gas that develops and because it's all packed in there the whole thing rises. Every day, I take a chopstick and jam it down the various sides of the the mason jar to get the gas to escape and repack everything down. (I called this "burping my kimchi"). 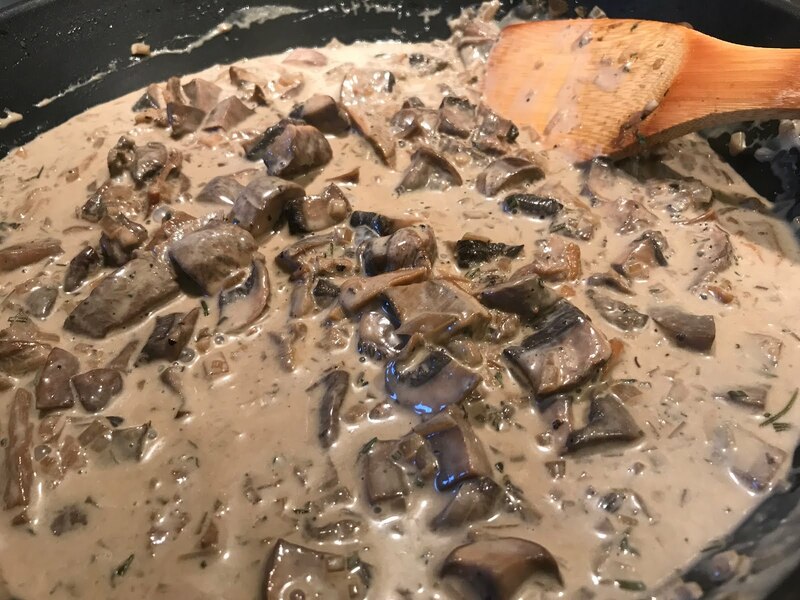 Take a piece of vegetable and taste it, when it's reached your desired sourness (ours took 2.5 days) you can put everything in the fridge which should slow down the fermentation (it will continue to ferment and get more sour but slowly). 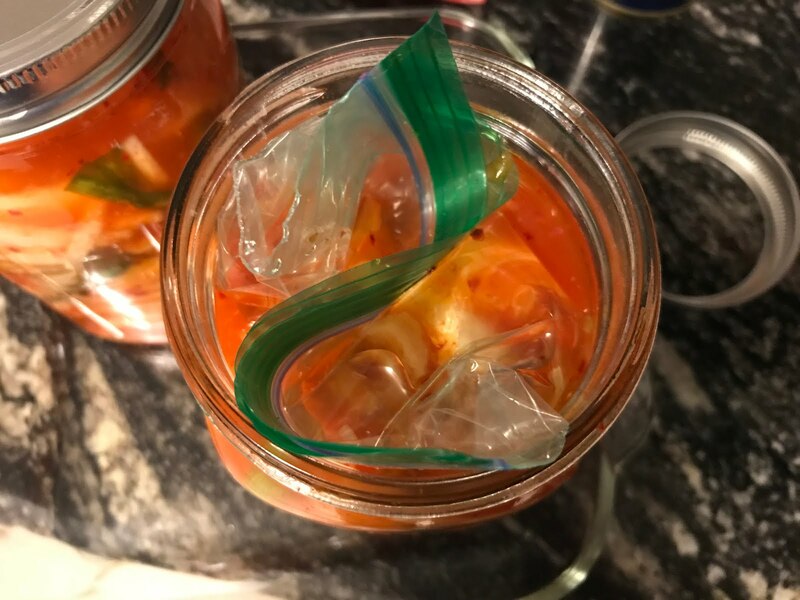 At that time you can take out the baggies of brine and you won't have the problem of over flowing anymore but you should maybe vent the jars every once and again. Don't be alarmed at the number of steps it was actually quite easy. The active time was less than an hour you spent a lot of time waiting around for the cabbage to wilt. 2) Wash the cabbage segments to remove any dirt and shake dry in a colander. Place the cabbage in a large mixing bowl and toss liberally with 1/4 cup of salt. Let sit for 30 mins. Then top with water until just covering leaves and cover with a plate to keep the cabbage submerged and weigh it down. Allow to sit for 4 hours. 3) Chop radish into 2 inch by 1/4 inch sticks. 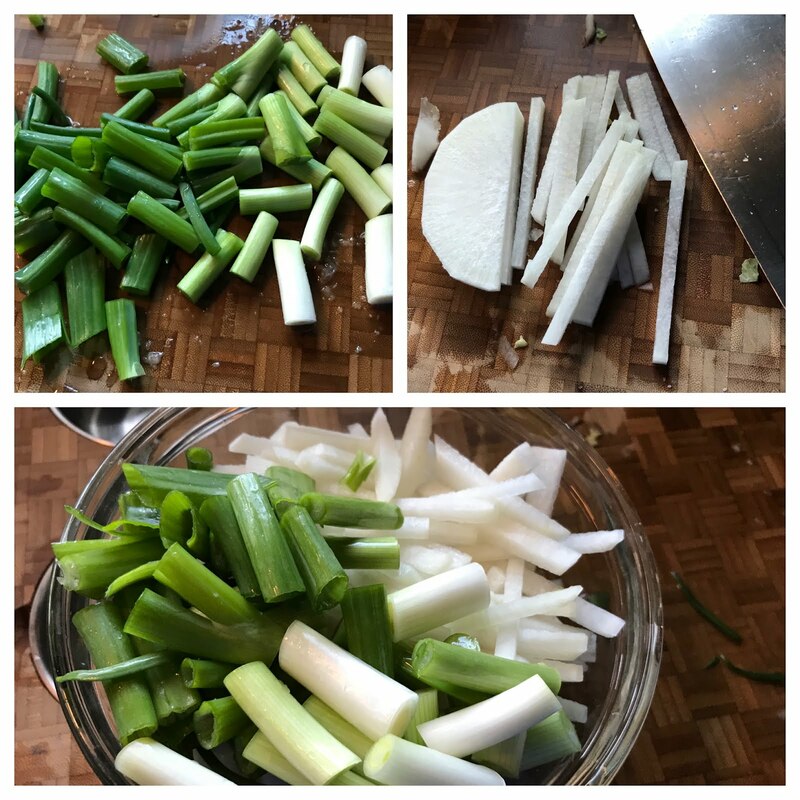 Cut green onion in segments of 1.5 inches. 4) Using gloves, Grate ginger and garlic, yielding approximately 1 tsp of each. 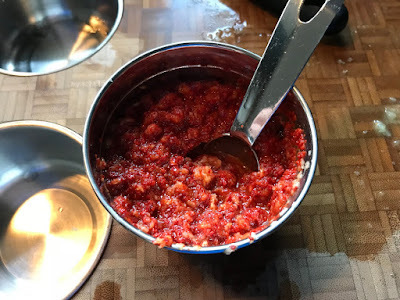 In a small bowl mix with red pepper flake and sugar into a paste. 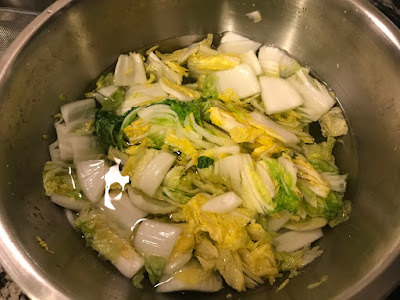 5) Drain and reserve brine from cabbage. Rinse the cabbage briefly to remove salt. Squeeze the cabbage to remove excess moisture and return to mixing bowl. 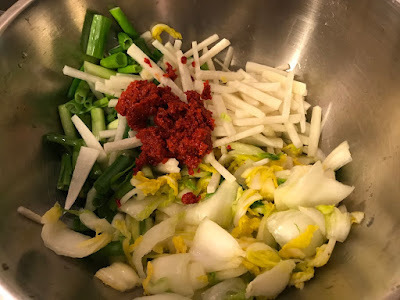 6) Again using gloves, add radish, green onion and Pepper paste to the mixing bowl with the cabbage and mix very thoroughly so that all of the vegetables are coated with paste. 7) Take the mixed vegetables and pack into mason jars leaving 1.5 to 2 inches of headroom. Really squeeze the vegetables into the jar. Cover with reserved brine. 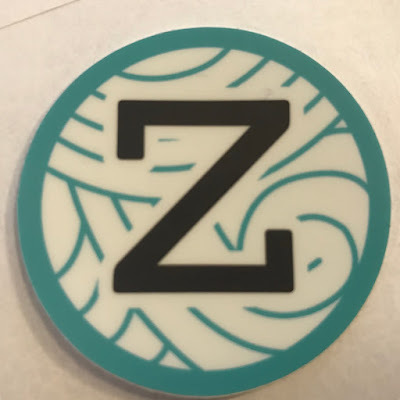 If you have floating vegetables fill a small ziplock snack bag with brine and weigh down the vegetables making sure everything is covered in brine. Loosely screw on the lid of the mason jar and put mason jars in a baking dish. 8) Allow the kimchi to stand in room temperature. Every day take a chopstick and stick it down the sides of the jar to allow excess gas to escape (be careful not to spill the brine) and taste a piece of vegetable. When the vegetable is at desired sourness remove the brine weight bags and place kimchi jars in the refrigerator. Hellos from a man of leisure. So yes I know it's been a while. After returning from Sydney back to Austin, my wife and I decided we should take time off together and travel. It's a rare thing for both of us to be off and not be constrained by vacation days left. We've seen some neat places and had some wonderful food. And as much as I have been posting about my trips here, it was far easier to post a few pictures on facebook. Long form posting is a tough thing to keep up with, and I was taking a break to recharge so that meant that this blog too had to take a break. It's hard taking pictures, touching up and choosing what you want to talk about. I am surprised I have been able to manage doing this for 10 years. I'm still contemplating what I will do with this blog, obviously since I'm not working there's not much bento making happening these days. And during my time off I've made some lifestyle changes the biggest being that I'm now mostly Vegan for health reasons. (I remove the restrictions while traveling) It isn't that I'm opposed to eating meat and meat products (lord knows I really crave a steak and bbq all the time) but the move has done wonders for my cholesterol and blood pressure and trying to get off the meds would be a great thing. The results have been astounding. But it also means having to retrain how I cook and nourish myself. My hope is that at some point in the future I can get to the point of having meat-ful mondays (instead of meatless mondays) and still get a little meat back into my life. It's been about a year and it took about 3 months before it got easier. Granted giving myself a hall pass when I travel certainly helps keep me on the wagon. There's still experimentation going on in the kitchen. I just made some kimchi. I'll probably post that at some point. 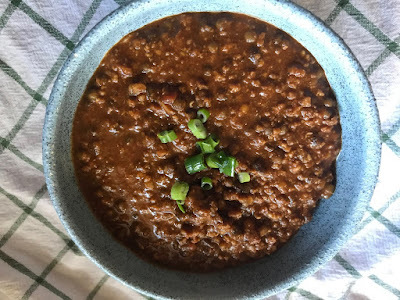 I also did a pretty rock solid vegan chili that my friend said that if I hadn't said it was vegan chili he would have given me a good score on some meat chili, but learning it was actually vegan he was truly blown away. Ok wow, this turned out to be a longer hello than expected. Well this is Man of Leisure signing off for now. More soon(ish)!